Thoughts from a Traveling Tech: Baby Poo or Delicious Condiment? The wife and I recently went to dinner at a quick service restaurant not far from the house. I order a burrito bowl and so did she, and as we were beginning to ring out I added chips and guacamole. 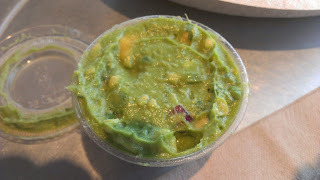 Although I have always held the opinion, much to my dear wife's chagrin, that guac looks like green baby poo I have until recently also felt that eating poo was not on my menu. Until recently that is. But as I looked further at this particular container of guacamole I can't help but see the resemblance to baby poo with the chunks of yellow and red. *Shudder* Sometimes people really need to just eat things without looking at it. How did you post today? Tasty enough, but not sure I want to always have this.